September 18, 2016, 9:09 PM · The annual Epcot International Food & Wine Festival is one of the best times of the year to visit the park. It can also be one of the busiest. 10. 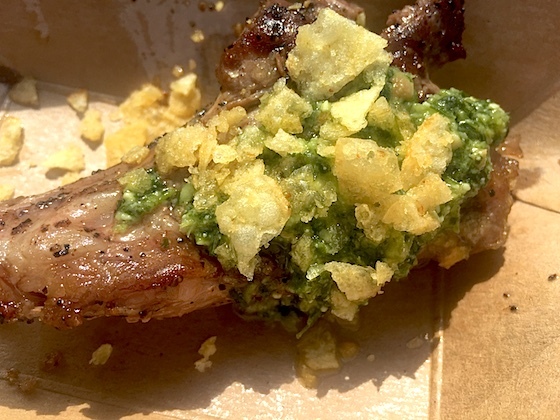 Grilled Lamb Chop – Australia ($7.25) –This grilled lamb chop comes with topped mint pesto and potato “crunchies” (basically what’s left on the bottom of your potato chip bag). The lamb chop is always a must-get when I visit each year because the ingredients go so well together. However, every so often they overcook it; I prefer a medium rare especially if I am paying that much, and that’s why I placed it farther down my list this year. 9. 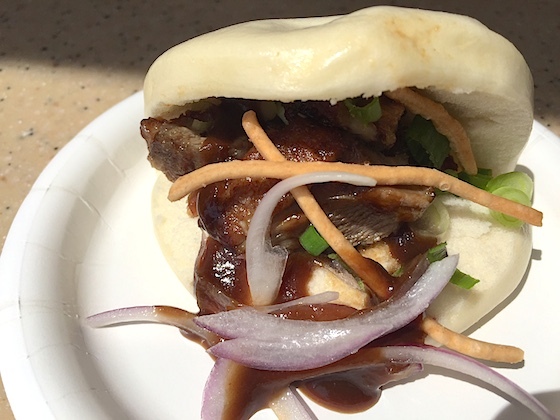 Beijing Roasted Duck – China ($6.50): Shredded roasted duck comes in a soft steam bun with hoisin sauce and garnished with sliced onions. I can eat steamed buns alone, so adding delicious roasted duck and sweet-but-salty hoisin sauce, makes it a top 10 for me. It can be a little heavy when it’s scorching outside, so find a cool, shaded spot and enjoy. 8. Loaded Greek “Nachos” – Greece ($4.50) A dish that was at the festival preview event and for good reason. This dish features meatless sausage, vegan Tzakiki sauce and pita chips. Really a great combination of ingredients that won’t leave you feeling heavy. My plate was full of food, making this an excellent buy. 7. 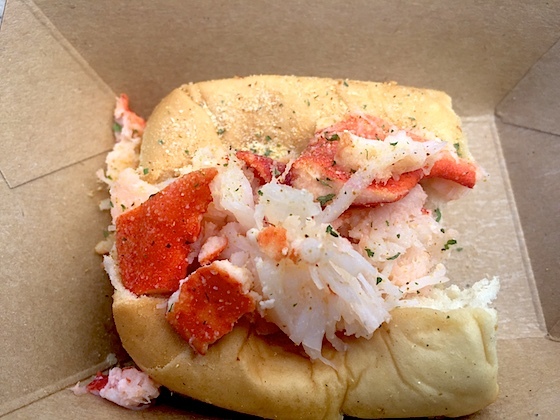 Lobster Roll – Hops & Barley ($7.75): Last year, as I mentioned in the festival preview article, they made a lobster mix with too many fillers. This year they decided to keep it more traditional by sticking mainly with lobster and it totally works. This is good because it’s one of the priciest dishes in all of the festival (i.e. a good place to use a Disney Dining Plan snack credit). On a side note, it’s a little different from the festival preview because they added a little more mayonnaise mix and seasoning which does make a great addition. 6. 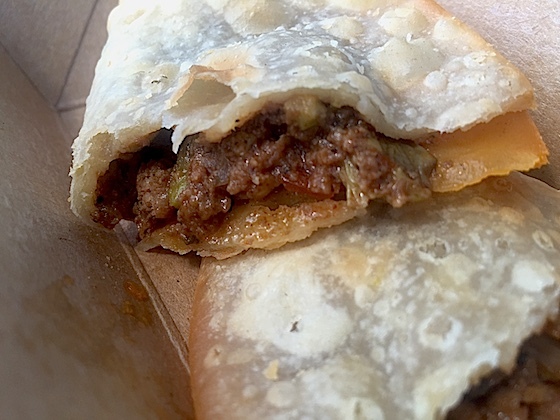 Empanada – Patagonia ($4.75): A popular dish making it back again this year. I remember one year the beef filling was basically all meat with little to no filling. One year they had way too much filling. Well this year they struck a fine balance with beef and filling. Another nicely priced dish because it’s a decent amount of delicious food for the price. 5. 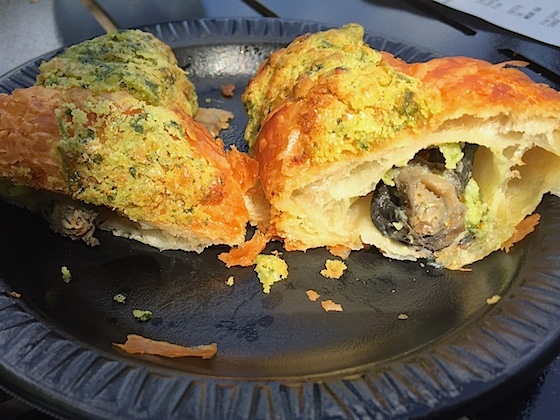 Escargot Croissant - France ($5.75): Imagine a flaky buttery croissant filled with even more butter and some garlic. Now add some escargots and you’ve got one absolutely delicious combination. Don’t be afraid to try this dish because of the escargot – you don’t want to miss out on this delicacy. 4. 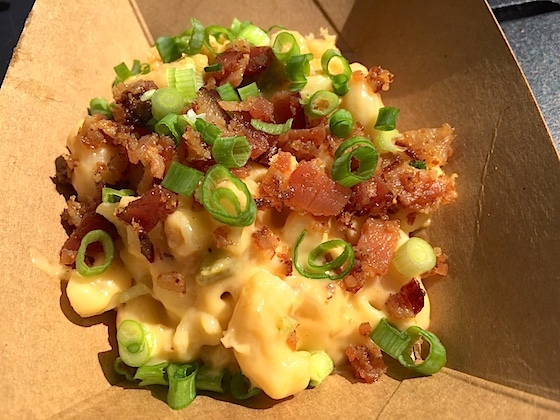 Loaded Mac & Cheese – Farm Fresh ($4.50): Mac & Cheese with Nueske’s pepper bacon, cheddar cheese, peppers and green onions. I’m a big fan of Nueske’s bacon because it’s some of the highest quality bacon one can get, with a nice proportion of meat to fat without being too salty. The bacon, peppers and onions add a tasty crunch to the soft and creamy cheddar mac. 3. Duck Confit – Greenhouse Guru ($5.25) – This was one of my favorite dishes at the preview and again here at the festival. 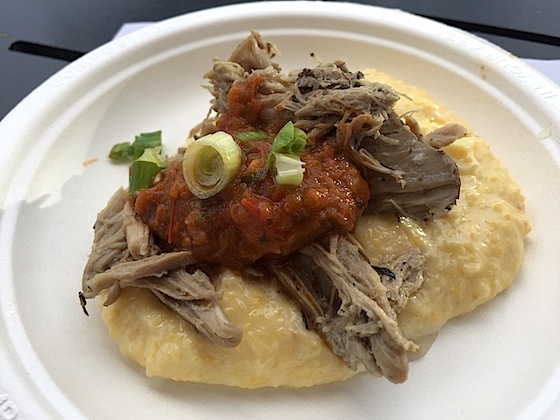 This dish has juicy duck confit (duck meat seasoned and slowly roasted in its own fat) with super creamy polenta and fire-roasted salsa. A perfect combination of ingredients that will want you having more. 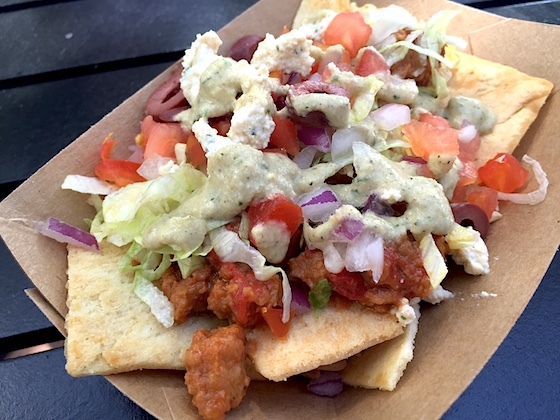 A dish that should be available year around at the World Showcase of Flavors food truck at Disney Springs. 2. 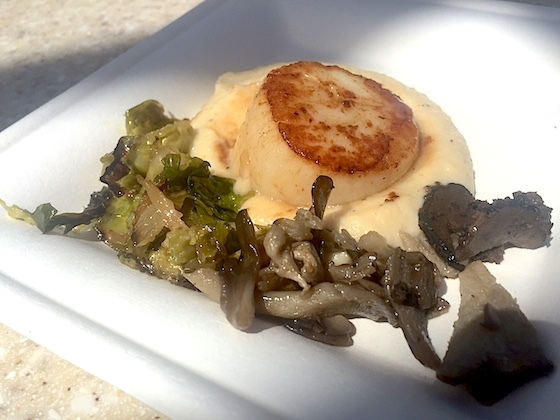 Seared Scallop – Wine & Dine Studio ($5.50) – A beautifully seared scallop on top of truffled celery root puree with roasted Brussels sprout and wild mushrooms. Another favorite dish I found at the festival preview, they did not have to change one thing to it. The celery root puree does not taste anything like celery and the Brussels sprouts were perfectly roasted. The wild mushrooms bring a good earthy flavor to this dish. 1. 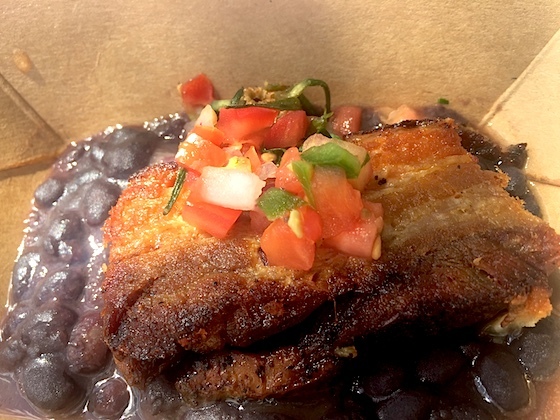 Crispy Pork Belly – Brazil ($5.50): Crispy pork belly with black beans and tomato salsa. This has made my list every year, but not number one until now. I think they learned how to cook this dish to perfection where the fat portion melts in your mouth and the actual meat falls apart. The black beans were delicious and the salsa was just enough to complete this dish. The line may be long on the weekends, but this dish is way worth it. Bonus: How can I get away without listing some sort of alcohol? 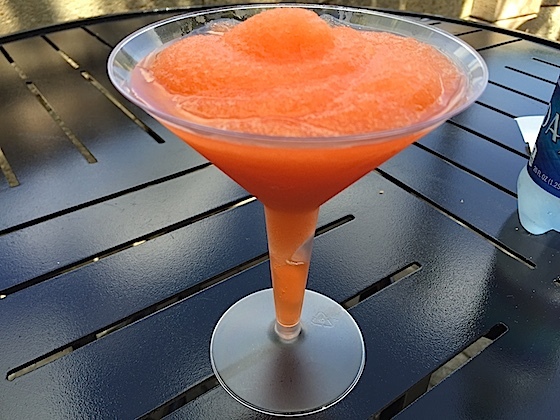 Well this year one of my favorite drinks so far has been France’s La Passion Martini Slush. It comes with vodka, Grey Goose Le Citron vodka, cranberry and passion fruit juice. It is just so refreshing on a hot Florida day. Did I mention you look fancy with it? Epcot has a way of keeping the best dishes coming back every year which I really appreciate. And the new dishes I hope they bring back for years to come. Epcot’s 21st Annual Food & Wine Festival runs through Nov. 14 and is not to be missed! I will be back again for my favorites. What’s your favorite dish at the festival? Comment here, or tag us in Instagram (ThemeParkInsider) or Tweet us (@ThemePark)! September 19, 2016 at 6:27 AM · Next year you should definitely try to hit rank every dish. September 19, 2016 at 6:33 AM · Great descriptions and pictures! Everything looks yummy! September 19, 2016 at 6:34 AM · Great tips! Looking forward to trying them on my trip next month! Nice job, by the way..
September 19, 2016 at 10:34 AM · Great tips! Can't wait to go next month! September 19, 2016 at 8:09 PM · I can vouch for the lamb chop! Very underrated! September 20, 2016 at 5:09 AM · All of it was amazing this year. The Passion fruit martini was definitely my favorite along with the bacon macaroni! Duck was also such a good taste! So glad this year they serve a lot more food for the same price. I went two years ago and they gave a little baby spoon scoop of food. September 21, 2016 at 8:13 AM · Has anyone tried the lettuce wrap this year? It was so good last year but did not make the list this year. September 21, 2016 at 7:26 PM · The lettuce wrap is very good. A delicious mix. Close to making the list for sure. By the way, thanks for all of the compliments everyone! September 23, 2016 at 9:55 AM · What are some top vegetarian dishes? I see the meatless dish from Greece, but I am not a big fan of fake meat.